It’s simple – read the eBook – use the worksheet at the end to help you translate the information into your own personal guide. Use this data that is customized to your likes and dislikes and your landscape characteristics as you work through the plant selection process. You will be on your way to success in your landscape – Demystified! by Learning How to Pick Plants! 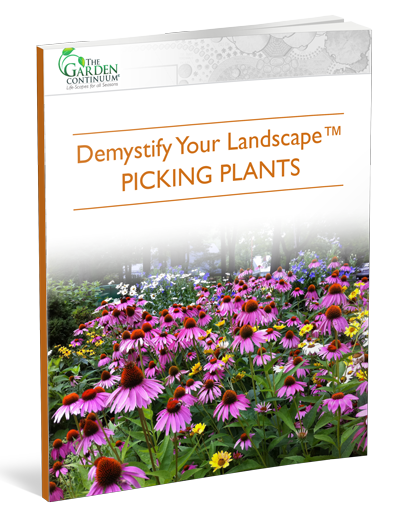 If you have ever wanted to learn more about picking the right plants for your yard or business this is a great read to get you started. By reading this eBook and doing the worksheet you will also SAVE a lot of time, money and troubles down the road. The answers to the worksheet that you will compile create a useful list of limiting factors that you should use as a tool to narrow the vast array of plant choices down to a small group that fits both your property conditions AND your project goals. Get the Picking Plants eBook Today!